Take a look at how one of Focus week's projects has made Gelli Primary School even more attractive. During Focus Week Miss Hatch and Mrs. Date took our Hockey squad to compete in the RCT Hockey tournament. Look at the PESS page on the school website to read the full report. Every child in Gelli Primary School is very proud to wear our school uniform. There are few exeptions when the whole school is not wearing the blue polo shirts and even in the summer pupils we wear blue shorts or blue pattern dresses. So........... this week the staff have joined in even Mr. Jones the Head teacher. The staff have voted to wear our polo shirts but to make sure that we can spot them amongst the children we decided to wear alternative colours, yellow and white. Here are Mrs. Wilkins and Miss Owen in theirs. They are trying hard not to look at the camera, but don't they look smart!!! This week's newsletter is available from the newsletter page on the school website. 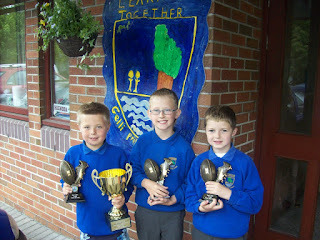 Gelli Primary pupils Ethan, Connor and Thomas are holding the trophies that were presented to them by Ospreys players Nicky Walker and David Bishop at the annual presentation evening held recently. The boys are currently in year 3 and have been members of the Ystrad squad this year. We are extremely proud of their achievements and look forward to next season when they will not only be playing for our local club side but attending rugby club at Gelli Primary and fighting for a place in the school squad. Thursday was Focus Week's Big Day. The Junior Wet'n'Wild outdoor events trip was fantastic DESPITE the weather. Reception went up to see if their flower shop in class was as good as the one in Gelli. The Infants had a picnic in the hall. Hey..... don't let me tell you click on the videos to see. Twelve year 6 children went to compete in the RCT Sports Hall Athletics competition held at Rhondda Fach Sports Centre today. Seven teams were entered from schools in the area, Gelli, Pontyclun, Tylorstown, Caradog, Cwmbach, Hafod and Maerdy. The girls and boys teams ran, threw and jumped well and won all their races. At the end when the results were announced they were the winners. They were very pleased to have beaten Pontyclun as Mr. Roberts our previous head teacher is now head teacher there. We sang a song for him just before he left and the chorus is very apt for this occasion – Pontyclun will never be as good as Gelli!!!!! The team will have to wait until they know whether they will be overall champions – the second heat was due to take place this afternoon. More news will follow. On another pleasant note the children sang “Happy birthday” to Mr. Gardner, deputy head teacher at Tylorstown who was celebrating his 40th birthday today. Here is a video of the children’s accomplishments today. Today............. Year Six began the day with ..... a very boaring English assessment AHHHHHHHHHHHHH. But then things got better because Mrs. O'Gorman took them swimming. Later they walked up to Ton Pentre to buy some fruit for their healthy eating activities later this week. Year 5 looked after the Jump Rope for Heart activities. Great practice for their play leader roles, thank you very much children. Year 4 worked with Groundwork and designed some fruit salads. Year 3 tasted fruit, undertook some science activities and took part in the Jump Rope Sponsored Skip. Year 2 and 1 decorated their friendship stops, skipped and worked with Groundwork. Nursery and Reception completed their murals, visited Donald's to buy bedding plants and planted them, then Mrs. Davies persuaded Mr. Jones the caretaker to construct a camoflage shelter in the garden. Thank you to Hywel and Rachel from Groundwork for their assistance today. Come back tomorrow to see what happens then. New newsletters have been posted on the newsletter page which contain information about Focus Week. In addition the Focus week page has timetables of all events planned for the week and information regarding what is required when during this week. This year's focus week is dedicated to looking after our future. Today's theme has been how we can make our children aware that we can shape our future by looking after our environment starting with our school grounds. Click on the video to see what happened. The next meeting of the Gelli Primary Parents, Teacher & Friends Association will be held at the Ton Pentre Football Club on Wednesday evening May 14th at 7. 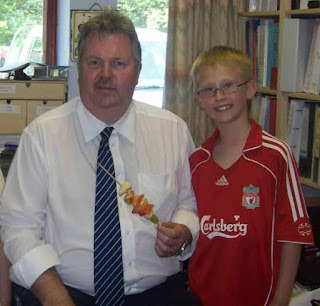 00. p.m. On the agenda will be ongoing arrangements for the Summer fete which will take place at the school on Saturday July 5th and the Year 6 Leaver's Ball at Ton Pentre Football Club on Wednesday 9th July 2008. If you are able to join us you will be very welcome. New members are always welcome. For further details click HERE to visit the Parent's Association page on the website. On the classroom page you can see updates of the various activities undertaken by each class. On the class pages you will see the timetables for each activity that each class will undertake each day, any specific requirements needed, packed lunch, clothing etc. 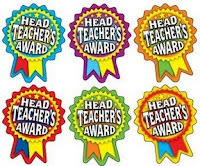 May I take this opportunity to thank the staff for their work in preparation for what will be a fantastic week where your children will benefit from an alternative curriculum which will be both educational and fun in the process. Please post any comments here during the week. Monday 19th May. The cost of the bus is £3.00, which needs to be returned with a permission slip if you would like your child to join us on the visit. A packed lunch will be needed on the day and the children will return back to school before the end of the day. • Rubber gloves in order to take part in the wattle and daub activity. The children will also have the opportunity to spin a woollen bracelet for themselves. You can download this letter by clicking this link to the Year 3 page. After their visit they will display some of the activities they have undertaken on this visit. Check back. The PE in School Sport page has been updated. Click below to follow the link to the page. Last week was a busy week for the children of Gelli Primary. 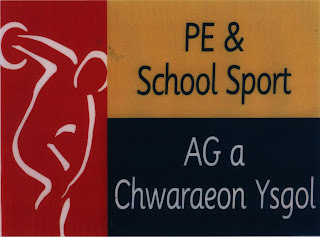 On Monday an after school rugby club for junior children began; Thursday we participated in an Upper Rhondda Cluster 10 a side touch rugby competition at Treorchy Comprehensive School (A video will appear soon); Friday was a very busy day with Year Five being trained as play leaders and the Girls and Boys football teams competing in the New Directions Football Tournament at Sophia Gardens, Cardiff. Click on this link to view the latest videos. Click here to view this week's newsletter.